Boxed in an extruded aluminum enclosure of 4.0×3.2 inches, the R-Box (RB) is designed as a low cost, portable data logger, and an industrial embedded controller. It integrates 16-bit ADCs, 16-bit DACs, 4-20 mA drivers, RS232/485/422, Relays, Opto-couplers, and CompactFlash for mass local data storage. The RB is based on a high performance C/C++ programmable 186 CPU with 16-bit external data bus supporting fast execution times through 16-bit Flash and 16-bit battery-backed SRAM. In order to secure a longer life time supply, the CPU chips come from two vendors, either AMD186ER or RDC R1100. Three internal timer/counters can be used to count or time external events, or to generate non-repetitive or variable-duty-cycle waveforms as PWM outputs. A serial real time clock (DS1337, Dallas) is a clock/calendar with two time-of-day alarms, supporting the ability for alarm-based wakeup from power-off status, allowing flexible battery savings. Three RS232 serial ports are available: A dual UART (SC26C92) and a single CPU internal UART(default as DEBUG port). All UARTs have deep FIFOs to minimize the potential of receiver overrun or to reduce interrupt overhead. 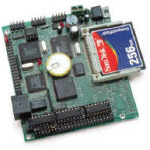 One UART can be buffered by RS232 (as default) or RS485. 20+ TTL I/O lines are free to use, including multifunctional CPUs PIO lines, and TTL I/Os from the SC26C92. A 16-bit ADC (ADS8344, TI) provides 8 single-ended or 4 differential analog inputs with 65536 count of resolution at up to 10 KHz sample rate. The analog inputs can be hardware configured for variable input voltage range, default 0-10V. A 16-bit DAC(LTC2600) provides 8 analog output voltages (0-5V). Two of the 16-bit DAC outputs can be buffered with 4-20 mA drivers for compatibility with industrial standards. The 4-20 mA drivers can be powered by local or remote positive voltage, up to 30V. 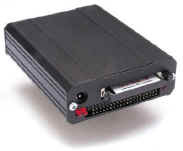 A 50-pin CompactFlash receptacle can be installed to allow access to mass storage CompactFlash cards (up to 2GB). Users can easily add mass data storage to their embedded application. 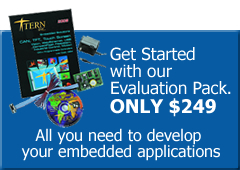 C/C++ programmable software packages with file system libraries are available. The RB has been designed with the industrial user in mind. Seven high voltage sink drivers are installed, capable of sinking 350 mA at 50V per line, and they can directly drive solenoids, relays, or lights. Four opto-couplers provide opto-isolation with both positive and negative inputs available on the headers. Two solid-state relays (PS7241, NEC), a GaAs LED on the input side and MODFET on the output side, are designed for AC or DC line switching. Two mechanical Reed Relays provide reliable, fast switching contacts with a specification of 200 V, maximum 1 Amp carry current, 0.5 Amp switching, and 100 million times operation. Optional Switching Regulator (LM2575) provides a shutdown feature(VOFF). It can enter A poweroff mode and can be waked-up by an active-low signal either from on-board RTC or external source. This poweroff mode allows battery operation in a remote location for a long period time. The RB can use 8.5V to 12V DC power supply with default linear regulator, or up to 30V DC with switching regulator without generating excessive heat. The RB is designed to fit in an aluminum extrusion enclosure. All signals on the two 20×2 pin headers are accessible outside of the enclosure. User can use W40(40 field removable screw terminals) to access I/O signals. Use one W40P on the front end, one W40S on the back end. Two versions of RB are available: the RB80 is based on 80 MHz R1100, and RB40 is based on 40 MHz Am186ER. There are other similar boards: the slightly smaller R-Engine is ideal for OEM applications that need only a core processing unit; and the R-Drive is a larger full-featured board that supports more industrial I/O, and provides on-board Ethernet. The R-Engine-A features more analog I/O options. The FlashCore-B is the choice for embedded applications that need a small OEM core-component with CompactFlash and data acquisition capabilities. Does not include add-on options.